I suppose they needed an epilogue to Secret Wars II because there wasn’t enough junk crammed down my throat concerning this crossover maxi-event. This is the aftermath, Molecule Man having defeated the Beyonder and the state of the Earth is in such upheaval, there may only be six hours left of life as we know it. Molecule Man lies in a coma, probably replaying in his head how he came to be such a heavy-hitter in not just one, but two secret wars. The Avengers, Fantastic Four and Silver Surfer must somehow convince this villain to come through for them by using his powers to stitch the world back together, even if it means losing his powers. Not a bad story overall, but too much talking, not enough action. 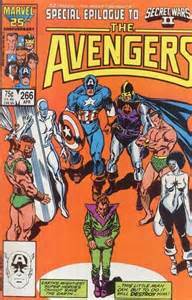 And hey, at least we didn’t have to deal with the Beyonder this issue!